The Constitution is a book of lessons, a book of learning how to become one with what is known and unknown. The first epiphany: that we each have our own body. We are individual. The second: that we must understand it. To Foley, our body is a universal placard of self-definition. What is health? What is our constitution? By coming to know our limits and our place in the world, we know our humanity, our personal composition. “As soon as we finish / we want to be // understood again” says the first Amendment, and so continues an enduring loop of self-examination. The body of the self, in the case of Foley’s book, is represented by the book and its speaker’s curiosities: namely, how is it to exist and to be okay with our own health and stability? In “Object Lesson,” “more than / one angry Achilles / is made into // ideal values / drenched in heroics / finding nothing / but the hope worn.” Foley explores existence through shadows of experience. Here the source is a myth, but one broken (through the line) into mindful fragmentation. The breakage is subtle, yet amplifies rhythm, like lungs breathing, like the skeleton’s individual bones creaking, and it shows us a world of slow, often depressed movement. 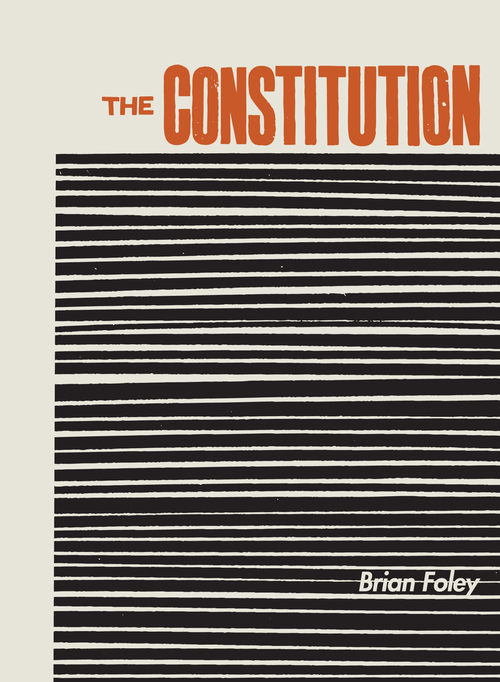 Like a ghost, The Constitution’s speaker takes us on a path of strange cause and effect. This poem could easily be a statement on the valueless eternity of our ephemera. But the world is vast and our impact on it may in part be very minimal. So we must allow “live / like live” as mantra to keep ourselves afloat. We must allow that which is to continue to be. Foley’s world is a world of speakers who own their “self” and their “identity” but only through a thorough disavowal. But that act of disavowal is the result of awareness. It is a process as spiritual as it is material. Through the Amendment process, we are being invited to improve upon prior fatalism. We are asked to make a judgment on our own perception, on our being. Though the damnation of the world may result in a darkness that depresses us, we must first come to know that darkness. We would never speak these lines. They are the lines of the synapse, the charges of the brain as we fall receptive to action. Foley’s speaker is a Cursed Poet, a poet whose writing shimmers with the hope of the known as long as you look, and as soon as you stop, shift the pressure, his work explodes in a new direction. Repetition of this perception is the basis for Foley’s reality, or what he claims as reality: it is a space of tweaks, morphs, and rifts. In “Picador,” “shadow invents / a sense of say nothing,” calling upon the need to be mindful in nature—though static in its presence—in order to maintain stability amidst darkness. But at the same time, his speaker is filled with the tragic inclination to never sit still. I empathized. Entropy is a golden constant. We are constantly giving ourselves up. We are “Shaped / by unattempt.” Foley’s poems teaches us how we give ourselves up—and why. Greg Bem is a poet and marketer living in Seattle, Washington. He works at the North Seattle College Library and co-curates the Breadline Performance Series.